Sometimes it’s the little things, you know? A new crack in your laptop case. The ice-cream scoop breaking apart as you’re scraping up a spoonful. Your phone rebooting (or not booting) all on its own. Or maybe a giant hole in the thigh of your favorite tights. My favorite tights are wrecked. Don’t get me wrong, I liked that ice-cream scoop, I’m praying my laptop will hold up for another year and with all the buggy problems I’m having with my phone I won’t hold my breath that it will stay functional for long. But it’s the tights that hurt. I’m a girl… so sometimes it really is about not being able to find my favorite lipstick, the perfect red one that seems to make everything pop. Or about that little black dress that just doesn’t fit quite right anymore. 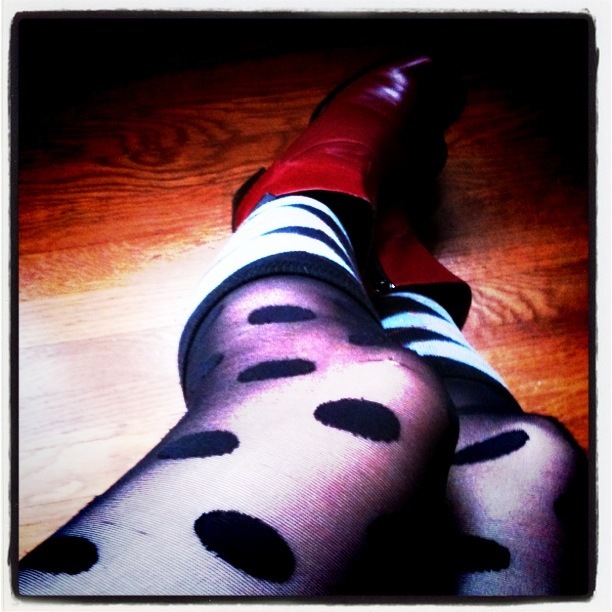 About my brows needing a wax, my shoes needing a shine, wanting a new red purse or the fact that my favorite tights, the sheer black ones with the opaque polka dots, are ruined. I wore them one last time today even with the holes. Hoping the skirt I had on would cover up the damage. I was just in the neighborhood. Just going about my daily routine. I smiled as I glanced down with my leg turned inward to hide the flawed nylon. I think I’ll just let them go. I’ll wear them this one last time and smile and feel pretty and confident and whimsical. But tonight when I get ready for bed I’ll peel them off one leg at a time, wrap them up and toss them in my little silver trash can. We’ll make a cosmologist out of you yet. Time for a new pair! Change is the only permanence Cami, change your shoes… Geez woman! Don’t waste the tights, take them to a consignment store or something, tell them your famous and that you want to see what you can get for them. Even better! Cut them into cool shapes and use that to decorate your laptop cover. Make a head wrap? Just long shooting there… anyway, if you love something let it change rather than dump it in the trash, c’mon your a creative type… run with it! I say Tank Girl the things. Sadly, its been nearly 8 months since I last checked in with my friends all about. And sadder still, when I do its only to learn of the demise of tights. On the plus side, at least you manage to have an upity attitude about the whole thing. They are lovely tights, but yes, the impermanence of tights is one of the things that give them some appeal. I had a pair of Henry Holland suspender tights once that laddered the second I got them out of the package. I still wore them, though, they were so hot. Bryan: Where’s that sock post you have percolating? Sybil: I may wait to do any tights shopping until they’re more seasonally appropriate. At least I’m rolling into spring. Alex: Somethings should be re-purposed, I agree 100%… but these I need to let go of. bubblewench: of course you do. landismom: True. It’s fun to see how long you can make them last, and holy hell I would have worn those suspender tights no matter the condition. I always wanted a pair. Oh I hear you. And it breaks my heart when I can’t replace something like that.